TekniGamma sterile wipers provide excellent critical cleaning performance in sterile clean environments, ranging from aseptic processing and filling to compounding pharmacy needs. This family of products is supported with a wide range of materials and configurations to meet common and precision cleaning applications in all classes of controlled environments. Available as dry wipers in various sizes, and pre-wet wipers in convenient pouches; in non-woven, melt-blown, and knit fabrics. Manufacturing of these wipers is ISO certified, and testing is conducted via IEST recommended practices. The Wipers are sterilized in compliance with industry standard ANSI/AAMI/ISO 11607, using Gamma Irradiation via Cobalt 60 processing for sterility assurance. 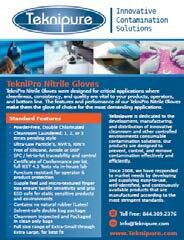 All pre-wet TekniGamma products are validated sterile through Steripro Labs and processed locally by Sterigenics. Certificates of Sterility and Certificates of Conformance are provided with each item and lot for verification and documentation compliance. Laundered Polyester knit wipes with sealed edges are best choice for critical or ISO 4 and 5 controlled environments. Provided pre-wet for immediate use or dry for on-site saturation. Non-woven Microfiber or Polyester/Cellulose blend, and melt-blown Polypropylene are ideal wiper substrates for ISO 6 and 7 controlled environments. These are also provided pre-wet for immediate use, or dry for on-site saturation.